Thanks for bearing with me. My computer went “down” a couple of times last week and after the second time my IT guy decided we would just set up my new computer (thanks Keith!). So, I am trying to learn Windows 7 and get everything back the way I like it. Still have a lot of files to transfer, but that can wait while I get a new blog post up. Lake Ogallala was chemically renovated last fall to knock back the suckers, common carp and other undesirable fish. When those undesirables are at minimal levels, competition is minimal and habitat conditions are excellent for trout in Lake Ogallala. We have already stocked nearly 10,000 catchable-size rainbows back in there. Growth rates of trout in Lake Ogallala can approach an inch per month under ideal conditions. The rainbow trout fishing in Lake Ogallala and associated waters is well on its way back and I expect excellent fishing there this year! There was a leak discovered in the dam of Lake Maloney that prompted a maximum draw-down of that reservoir this past fall. The latest report I heard was that repair work had started and if everything went well that work could be done in time for re-filling of the reservoir this spring. There was some water left in Maloney this winter, but I am sure the fishery was significantly impacted. The good news is that as soon as water starts to flow back into Maloney there will be fish flowing in with that water. If repair work is completed on schedule, there will be fish stocked there this year in addition to the fish coming down the canal. Recovery at Maloney should not take long. In late January it was noticed that some water was tricking from the dam at Johnson Lake. The last I heard they were not sure if that was a problem with the dam or if there was just some snow melt there. As a precaution the Central Nebraska Public Power and Irrigation District dropped the reservoir level 2 feet and they are continuing to monitor the situation. Let us hope that it is nothing more than snow melt. You can keep up with developments there, http://www.cnppid.com/ . Pibel is not a large body of water, just a 20-acre pond, but it is an extremely important fishery in that part of the state (southeast of Bartlett). We completed an Aquatic Habitat Rehabilitation Project at Pibel back in 2000, http://www.ngpc.state.ne.us/fishing/programs/aqhabitat/ and the fishery was well on its way back and then there was a fish kill due to a little pollution problem. We were recovering from that when a leak was discovered in the dam last summer. So, the water level was dropped and work was started on the dam. My latest on Pibel is that the work has been completed and the pond is back to being full again. I am not sure what impact the draw down and work had on the fishery, but keep your fingers crossed that the fishery is on its way back, again. A major Aquatic Habitat Rehabilitation project is on the drawing board for Carter Lake. My buddy Greg Wagner had an excellent blog post on that project, check it out, http://inthewildwithwags.wordpress.com/2010/02/02/angler-reminder-for-carter-lake/ . I wish I had some really good news about Red Willow Reservoir north of McCook, but I do not. They are still trying to determine the extent of the problem there, and I am afraid that alone could take some time. You can keep see updates on the situation there, http://www.usbr.gov/gp/nkao/redwillow/ . Water levels at Red Willow are essentially as low as they can go right now. Fish need water and the low water levels at Red Willow will no doubt have a negative impact on that fishery. But keep in mind that even at the minimum pool level there will be approximately 590 acres of water left in Red Willow and there should be at least some water over 20′ deep (maybe quite a bit deeper than that depending on sedimentation over the years). I do not expect the Red Willow fishery to go entirely “belly up”; it will be impacted, but there are still fish left in there and they should be able to survive. I believe there will be at least one boat ramp that will still be usable at minimum pool, but we will hear some reports on that when we have liquid water again. According to the latest report I read, the road over the dam is closed and the outlet, tailwater area is also closed, but the rest of the area remains open. I have not heard any guesses on how long Red Willow is going to be at minimum pool or how long it is going to take to fix the problem when they finally figure out the extent of it. At this point I do not believe anyone knows. The kids and I made it out onto the ice for a short trip over the weekend. We did not hammer them, worked hard to dry off a couple, three largemouth bass. 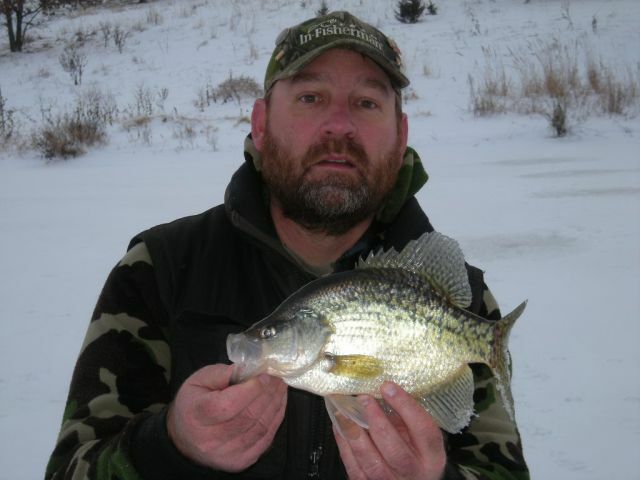 We will get a thaw going here sometime and some of the best ice-fishing of the season lays just around the corner! I am far from giving up, got a lot of fish to ice yet this winter! GO FISH! Just looked over the netting results for 2009.
whitebass at Elwood. Nice size and lots of them. Why a limit of only 3. If I can’t tell the difference between a Whitebass and a Wiper, I should be given a citation. And on another note! Why can’t we drive our ATVs from the Elwood campground to the ice? It just does’nt make sense to have to load up the ATV into the trailer or pickup just to go the few hundred yards to the parking lot. You will get no argument from me. Almost every state but Nebraska manages white bass and wipers with separate regulations and expects their anglers to know the difference between those fish. I have lost that argument time and again; apparently Nebraska anglers are not as smart as anglers in other states????????? I will add this, the white bass populations in waters like Elwood are entirely different from reservoirs where gizzard shad are the primary prey. In short white bass in shad reservoirs “live fast and die young” and anglers might as well harvest them. Lower bag limits and length limits likely would have no effect with the high rates of natural mortality. White bass populations in reservoirs like Elwood will be lower density but have the potential to produce some big white bass. It is probably appropriate to manage those white bass fisheries with more restrictive regulations because they are capable of producing high quality white bass fisheries. I am assuming someone told you directly that you could not drive an ATV from the private campground onto the ice? I suppose that technically you would be driving an ATV on a Wildlife Management Area (WMA) to go from the campground to the ice and ATVs are not allowed on WMAs. Seems like the concessionaire could make some kind of arrangement where that would be allowed?